Key features: Allows users to turn their Windows 8 tablets into a full-function desktop with a single USB 3.0 cable that connects to the network and peripherals, including up to two displays. More info. Key features: allows customers to take a system’s overall risk into context when deciding what level of privileges a user or system should be given, combining vulnerability management, least privilege and session monitoring capabilities. More info. Key features: a cloud-based service that analyzes long-term network access data to provide a unique perspective on BYOD trends. The new version leverages data from across the BYOD ecosystem to identify and manage risk. More info. Key features: the first solution to expose precisely when and how IT infrastructure conditions impede performance of critical business applications. More info. Key features: can now discover malicious peer-to-peer (P2P) communications. 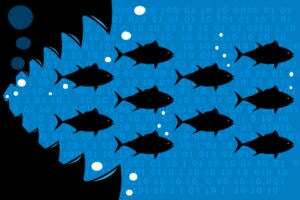 Damballa Failsafe uses behavioral detection techniques to identify malicious P2P communication attempts from malware trying to evade detection. More info. Key features: dinCloud’s cloud orchestration and management platform, dinManage, enables users to control a virtual private data center. Admins can provision, de-provision services, configure systems, and manage their account. More info. 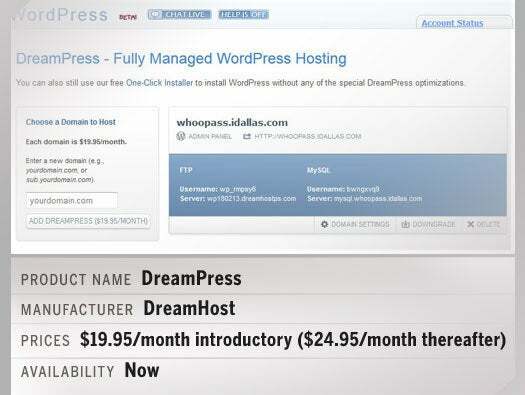 Key features: DreamHost has launched DreamPress as a managed WordPress hosting service. Subscribers will get enhanced WordPress performance, advanced security, excellent reliability and ease of use. More info. Key features: Battery backup and surge protection device for workstations and entertainment systems provides energy savings up to 30% and an intuitive LCD interface. More info. 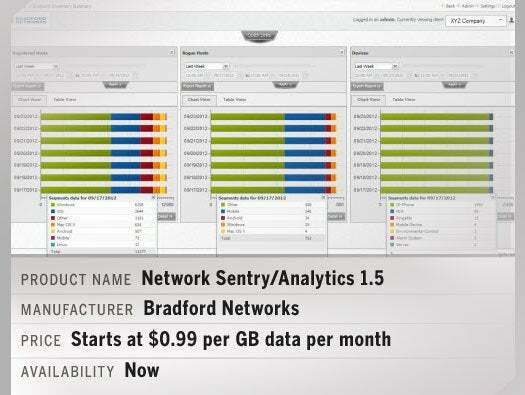 Key features: First SDN solution for both wired and wireless deployments. Provides a catalyst for innovation where collaboration & orchestration with other applications are necessary for the agile delivery of new services. More info. Key features: the next-generation mobile security and enterprise mobility management (EMM) solution for Government and Enterprise offering a full suite of modular services for mobilizing sensitive business data, managing a wide range of mobile devices and apps, and embracing BYOD – all while meeting the complex security and compliance requirements of government agencies and enterprises in regulated markets. More info. Key features: Windows installation development offering that helps development teams to be more agile, collaborative and flexible when building InstallScript and Windows Installer (MSI) installations for desktop, server, Web, and mobile applications. More info. 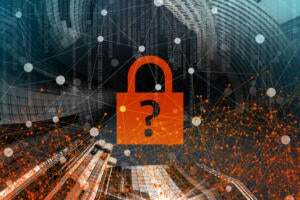 Key features · offers Feature Select to easily choose from a variety of security configuration options, Contextual Visibility for real-time and historical insight into the network, and Advanced Threat Protection enhancements. More info. Key features - Open-source expansion board built entirely with Gumstix’ Geppetto custom design platform features 3.5 inch LCD resistive touch screen, 3D accelerometer, audio in/out jacks, two USB mini-B jacks, console port and more. More info. Key features: acts as the first line of defense attempted attacks to overload servers and network peripherals. It distributes incoming data traffic to resources that can process the traffic more efficiently More info. Key features: Customers can now enable compliant requisitioning to all employees by simply adding a skin on top of their existing ERP investment without buying or implementing a separate eProcurement solution. More info. 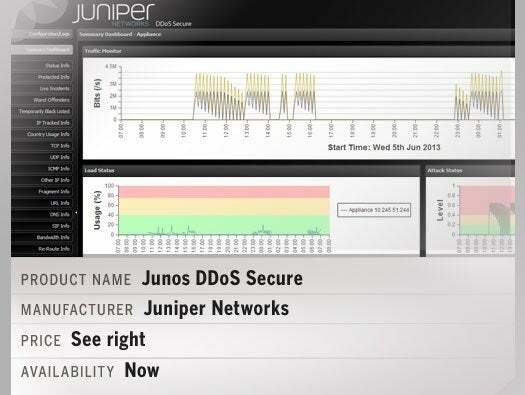 Pricing: Junos DDoS secure is offered as both a perpetual and subscription software license. Perpetual license is priced at $18,950 per 1 Gbps and 1 year subscription license at $8,950 for 1Gbps. Software maintenance via the Juniper Care Software Advantage is provided at an additional fee for perpetual licenses. 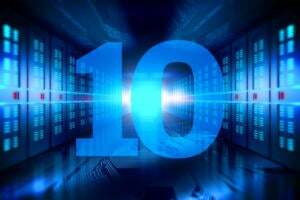 Software maintenance is included in the subscription license fee. Key features: Uses behavioral analytics and detailed network visibility to provide scalable protection against all major types of DDoS attacks, including protection against "low-and-slow" application attacks, and mitigation against volumetric attacks. More info. 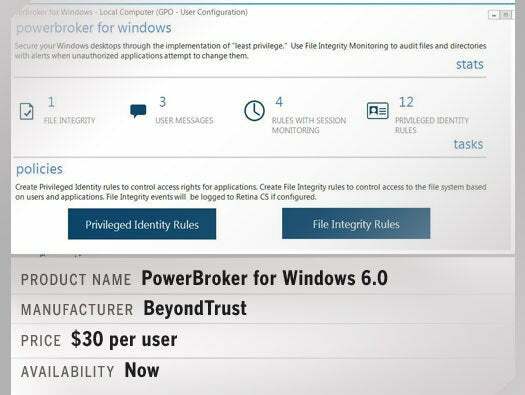 Key features: ERPM is the first privileged identity management solution capable of enabling secure check-in/check-out of privileged credentials directly from the McAfee ePolicy Orchestrator web-based interface, providing identity and configuration data enrichment for McAfee ePO. More info. Key features: Audit Manager helps organizations manage and document the end-to-end audit process through flexible data collection, automatic audit and remediation tasks, and supporting risk-based audit planning by harmonizing organizational risk data. More info. Key features: For continuous monitoring, IPsonar ESI’s hybrid active/passive discovery provides comprehensive network visibility through active baselines seamlessly coupled with real-time, instant discovery of new routes, paths and devices around a network. More info. Key features: Manages open source license compliance in real-time, on the desktop. Developers are alerted as soon as a violation is detected – as code is brought in. More info. Key Features: Leverages the power of Big Data to help security and fraud teams visualize and quickly analyze millions of user web-session activities to identify fraud, security threats and business logic abuse in real-time. New features include Streaming Analytics, Incidents Functionality and an Intelligent User Interface. More info. Key features: Rsam GRC Platform Version 8 includes major updates, including a a completely redesigned user interface, improved navigation to handle big data, new charting and dashboarding and more. More info. Key features: Savage IO adds Savi 360 Remote Monitoring Powered by AppFirst capabilities to all DataBricks, its cloud storage solution. AppFirst collects data and delivers visibility and insight that gives customers real operational intelligence into all of their data sources. More info. Key features: First closed-loop solution that predicts renewal revenue opportunities and tracks the resolutions to continuously improve revenue yield, Provides executives with an at-a-glance dashboard containing actionable predictive analytics to maximize customer lifetime value. More info. Key features: Free code review tool for development teams with up to 10 members. Pro: Provides extensive code review and full technical support for teams of up to 25 developers. More info. Key features: features asset auto-discovery with scheduled, automated discovery of hardware and software assets. 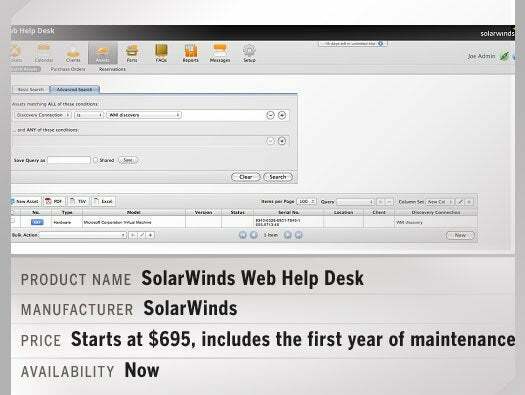 Web Help Desk also now integrates with SolarWinds network and systems management software. More info. Key features: now features DameWare Mobile, a mobile iPhone and iPad application that allows IT admins to connect remotely to Windows desktops, laptops and servers and share users’ screens. More info. Key features: Organizations will be able to conduct targeted forensic investigations by remotely deploying and installing Spector CNE Investigator on Windows and Mac computers. Features include visibility into program activities, keystrokes typed, file transfers, keyword-based alerting, emails and central playback and review. More info. Key features: Orion is a family of pre-configured Operational Intelligence applications that help IT monitor, analyze and act on patterns, anomalies or opportunities within massive amounts of data in motion. More info. 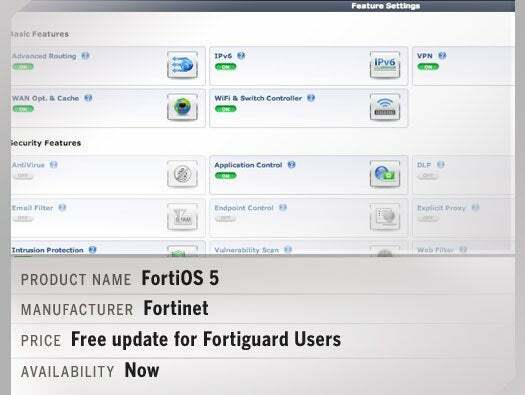 Key features: Provides out-of-band access to console port functions on up to 40 remote devices. Includes dual Ethernet ports, dual power inlets with built-in ATS, state-of-the-art security and authentication features, plus monitoring and alarm capabilities. More info.